Research published to mark the beginning of World Green Building Week suggests that businesses in Europe could realise savings of up to $243 billion in reduced rental costs alone if their office buildings were refurbished to the most efficient standards. 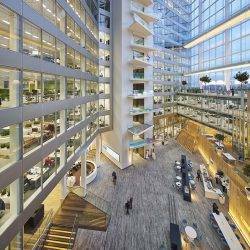 The analysis from Philips Lighting, claims the impact that could be made on rents across the world’s offices if business owners replicated the efficient usage of space achieved in a leading green building. The research suggests that in addition to reducing their carbon footprint, office tenants could see vast financial savings if their buildings were renovated in a way that uses space more effectively, particularly in buildings with a high number of empty spaces. The report calls for a doubling of the renovation rate of offices in developed countries to reach 3 percent per year, which it says will be a key factor in reducing emissions and offsetting increased global demand for energy from population growth and urbanisation. One of the leading examples of this is how Deloitte accomplished a 50 percent reduction in the space required per employee in The Edge building in Amsterdam compared to its previous premises The Chrystal Tower, through effective use of smart technology. However the data argues, the potential rent reduction from optimising offices is just a small proportion of the total financial benefit to businesses, which also include lower utility bills and significant gains in the productivity of employees, the largest cost to most businesses. The JLL 3-30-300 rule of real estate suggests that a company’s typical costs per square foot per year are $3 for utilities, $30 for rent and $300 for payroll, highlighting that gains in employee productivity are worth far more to a company in financial terms than rent reductions or increases in energy efficiency of the same percentage. Globally, businesses could realise savings of up to $1.5 trillion if offices were optimised in this way. Asia Pacific is the largest market for office space, with a total of over 65 billion square feet of office space. As such, it currently has a potential $977 billion of reduced annual rent for commercial tenants if buildings were optimised in line with best practice. This is more than the total economy of Indonesia. North America has a total of $220 billion dollars of potential savings, and Latin America over $28 billion-worth.